Cromer Pier01263 512281work PierThe Famous Cromer Pier is a Grade II listed, 151 metre long traditional and unspoiled Victorian pier, Award winning Pier of the Year for 2015 by the National Piers Society. We are extremely proud to be one of only five UK end of Pier theatre’s and home to the only end of pier show of its kind in the World! The famous Cromer Pier Show has been enjoyed by generations of visitors, traditional live variety with a thoroughly modern feel. Enjoy a full day out on the Pier, all year round. Simply perfect for grabbing a precious bit of “you” time. Peace and tranquility all year round, nature paints a whole new picture every day giving you a completely new experience every time you visit. Absolutely the best crab fishing anywhere in Norfolk, you can grab all you need (except for maybe, patience) for the big catch in our perfectly stocked gift shop at the entrance to the pier. Not just for the little ones, it’s a great way to spend quality family time together, healthy competition guaranteed. Enjoy delicious refreshments in a unique setting on our quarterdeck with priceless views of the stunning North Norfolk Coastline and if you are lucky for may even experience one of those sunsets that everybody talks about. The Famous Cromer Pier is a Grade II listed, 151 metre long traditional and unspoiled Victorian pier, Award winning Pier of the Year for 2015 by the National Piers Society. We are not a million miles away, the Pier is a must visit whether you are local or visiting the area on holiday. Open from 10am daily. Closing times are subject to change. 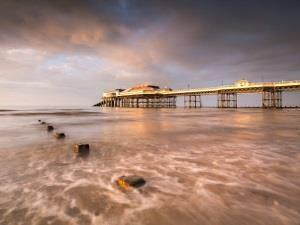 Free entry to the Pier, special group rate and concessions for the Cromer Pier Show.